Earlier this year, OFRI published a report titled “Impacts of Oregon’s 2017 Wildfire Season.” In it, we documented the hidden costs of fire, including impacts to air quality and health, school athletics, travel and tourism, employment and the economy, transportation, and iconic Oregon economic sectors such as the state’s wine and timber industries. By all counts, last year’s fire season was horrific. The state experienced hazardous levels of smoke, including 160 days considered “Unhealthy for Sensitive Groups.” As thick smoke blanketed the state, emergency room visits increased by 86 percent the first week of September. The Oregon Shakespeare Festival in Ashland canceled nine performances, a direct loss of $373,000. The community of Sisters scratched its annual folk festival, losing $1.2 million in local economic impact. Cycle Oregon canceled its annual ride. For three weeks, drivers were detoured off their usual route across Interstate 84. More than 7,000 people were evacuated in order to escape fires in central Oregon, the Columbia River Gorge and southwest Oregon. In the four-page summary of the 24-page report, we asked, “Where do we go from here?” I’m happy to report that people are stepping up. 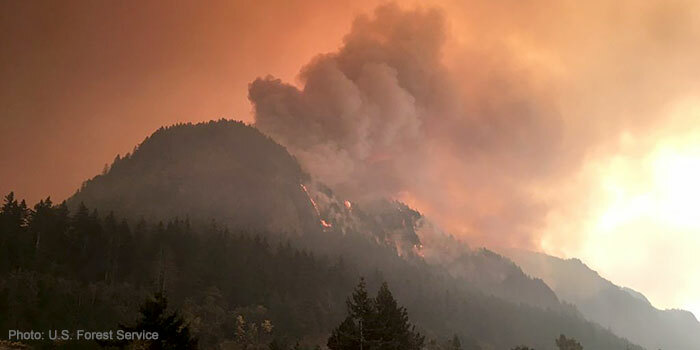 In early March, the Oregon State University College of Forestry put on a two-day “Fire Summit,” where scientists and policymakers discussed potential solutions to combat worsening fire seasons. A report of those proceedings is expected this spring. In April, OFRI and several other sponsors hosted “Era of Megafires,” a presentation featuring U.S. Forest Service Pacific Northwest Research Station landscape ecologist Paul Hessburg. This spring, our federal lawmakers also took a positive step. After six months of continuing resolutions, Congress finally passed, and the President signed, the $1.3 trillion Omnibus Appropriations Act, a plan to fund federal agencies for the remainder of 2018. Perhaps no part of the act is more important to Oregonians than a plan to improve the way the federal government pays for wildfire suppression, as well as some much-needed forest management reforms. The effort to change how the federal government pays for fighting wildfires dates back to 2014. That’s when it became obvious that federal firefighting costs were robbing other parts of the U.S. Forest Service’s budget originally earmarked for funding forest management, including restoration, thinning and other measures that reduce wildfire risk. The old plan clearly had failed. Wildfires continued to grow in number, size and intensity. And for many Oregonians, the 2017 “Summer of Smoke” was the last straw. Oregon’s forests will never be “fire-free.” Nor should they be. Wildfires are part of the forest ecosystem. They remove fuels that can create conflagrations that endanger watersheds, wildlife and communities. Fires thin out smaller trees, allowing more water, sunlight and nutrients to reach the remaining trees and shrubs. They also create forest clearings favored by pollinators such as bees, butterflies and hummingbirds. We have to live with a certain amount of fire and smoke, but we also need to manage our national forests for forest health, fire resiliency and public safety, including creating safer conditions for wildland firefighters. Fortunately, the omnibus bill includes some common-sense reforms. These include allowing the repair and reconstruction of forest roads under a deal that allows state agencies to perform forest management activities on federal land; creating legally sufficient pathways for hazardous fuels and wildfire resiliency projects; amending what’s known as the Healthy Forest Restoration Act to allow creation of fuel breaks and firebreaks; and managing vegetation around power lines. It’s taken more than 100 years to create the crisis in our public forests, so we can’t expect results overnight. But Congress’ action is an important first step of many more to get us on the path to healthier, more fire-resilient forests. As I write this, I am just coming off three days of building tours, plenaries and breakout sessions at the third annual International Mass Timber Conference. 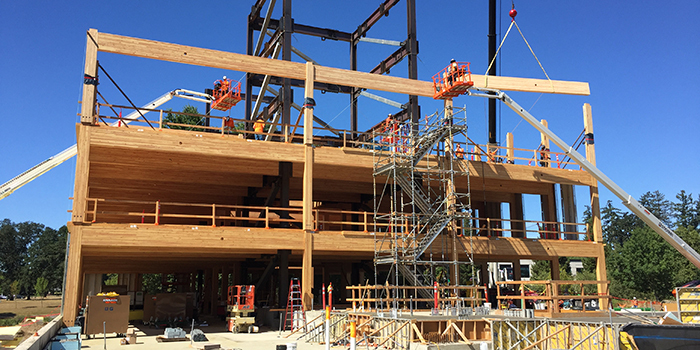 I joined more than 1,200 others as mass timber construction enthusiasts from 21 countries gathered to share the latest information about a building technology that is slowly but surely changing skylines across the world. I was most struck by the closing panel discussion led by North American Forest Partnership Executive Director Will Novy-Hildesey. Referring rather opaquely to the forest product industry’s tendency to ignore resource extraction issues when touting mass timber’s many benefits, panelist Nicole Miller, managing director of the environmental consulting firm Biomimicry 3.8, beseeched us to be more transparent. And so I will be: Clearcuts happen. Strip mines also happen. Limestone quarries happen. Climate change happens. As do population growth, affordable housing shortages and homelessness. 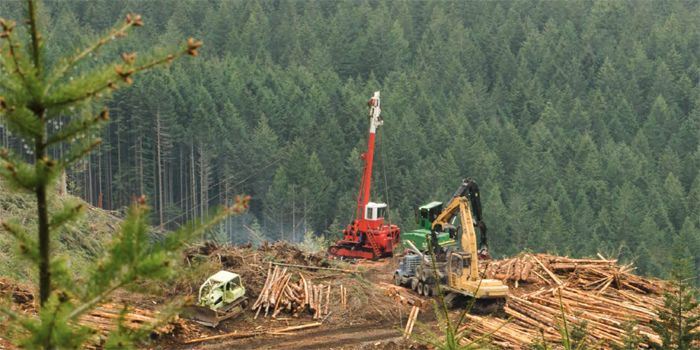 Clearcuts happen for a variety of reasons and in a variety of places. Clearcuts happen in tropical rain forests and in forests certified by the Forest Stewardship Council. And clearcuts happen in Oregon. Clearcuts happen because it’s a more economical way to harvest some types of timber, and clearcuts happen because certain tree species need openings with direct sunlight to reproduce. This is particularly true for Douglas-fir, Oregon’s most prominent and most valuable native species, used primarily in building construction. 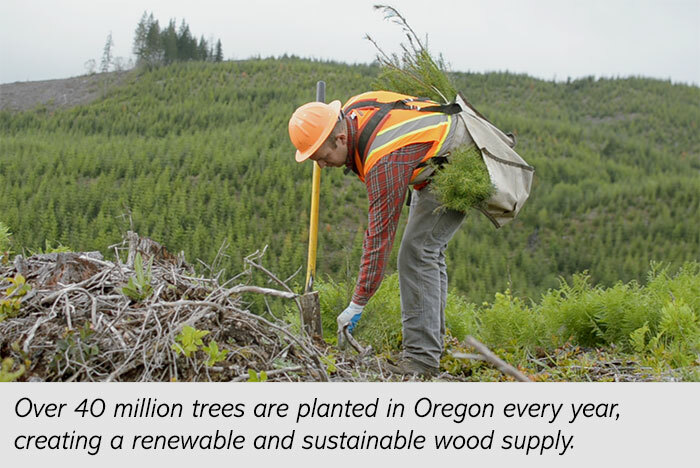 Reforestation also happens, to the tune of some 40 million seedlings planted every year on harvested lands in Oregon. Granted, when clearcuts happen and they are replanted with native tree species, as is the law in Oregon, what grows back is not the exact same ecosystem as what was removed. But it is a forested landscape that provides habitat, recreation opportunities and carbon sequestration benefits, among other values. When strip mines and limestone quarries happen, those resources are not, and cannot be, replenished. When forests such as those that once occupied the island of Manhattan are clearcut and replaced by massive cities, no amount of biomimicry can replace what was lost. Let’s face it: Human population continues to grow. We need to, and will continue to, construct buildings. We have choices in what materials we build with. Every choice we make has implications. As was made abundantly clear during the three days I spent at the Mass Timber Conference, mass timber technology is often vastly superior to the dated building technologies it is replacing. Conference speakers praised its affordability, efficiency, and fire and seismic safety, and even noted how exposure to wood in buildings can improve our health. Many, including Ms. Miller, spoke passionately about how using wood in more of our largest buildings gives us a real chance to not only reduce carbon emissions but actually to combat climate change, thanks to its tremendous carbon storage potential. One building material is derived in part from clearcutting, is 100 percent renewable and stores carbon. Given the options, I choose that one. We all should. Like the tumultuous times sung about by Bob Dylan in 1964, Oregon’s forest protection laws and rules promulgated in the early 1970s are a-changin’. And by quite a bit. The Oregon Forest Practices Act is the law that governs how forestry is practiced on state and private forestlands in Oregon. The law was originally passed by the Oregon Legislature in 1971, with the first rules created in 1972. Since then, the forest practices rules outlined in the law have changed 38 times to ensure the regulations are in line with the latest scientific findings. The most recent changes were made in 2016 and 2017. They include setting no-spray buffers for aerial herbicide use around homes and schools; increasing the size of tree and vegetation buffers that loggers must leave around many salmon, steelhead and bull trout (SSBT) streams; and revising the bald eagle rules to match science and the successful recovery of their once-declining populations. The graphic above shows the newly revised requirement to leave a wider buffer of trees on either side of a medium-sized SSBT stream in what’s known as a Riparian Management Area (RMA). There are several required zones in the SSBT stream buffer where varying degrees of timber harvest are allowed. All the trees must be left in a “no-harvest zone,” located 0 to 20 feet from the stream’s high-water level. In the “inner zone,” located 20 to 50 feet from the high-water level, and the “outer zone,” located 50 to 80 feet from the high-water level, some trees can be harvested. Compared to a non-SSBT fish stream, the RMA is 10 feet wider and the leave trees need to be split between the inner and outer zone, with a minimum number of trees per acre and basal area in each zone. The Oregon Board of Forestry created these SSBT rules in 2017 to prevent an increase in stream temperature, which can negatively impact salmon, steelhead and bull trout. In 2002, the Oregon Forest Resources Institute published the first edition of Oregon’s Forest Protection Laws – An Illustrated Manual. OFRI published a revised second edition in 2012. A newly revised third edition is now available. It includes the new rules for aerial spray buffers, SSBT stream buffers and bald eagles. It also includes an update to the Industrial Fire Precaution Levels (IFPL), which dictate fire-season restrictions on logging and other forest work. You can download or order the new third edition of the Illustrated Manual through the publications page on OFRI’s website. In addition to the print version, which can be ordered, and the full electronic version, which can be downloaded, we provide downloadable individual chapters as low-resolution PDFs. These chapter PDFs are easily accessed on a tablet or other mobile device. Copies of the updated Illustrated Manual will be available at all Oregon State University Extension Service Tree Schools this year, and at the Oregon Small Woodlands Association Annual Meeting in June. 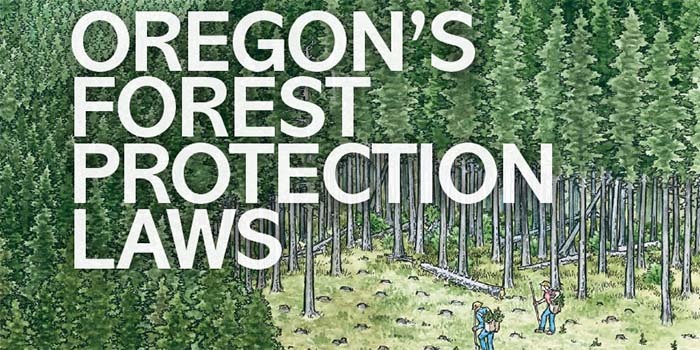 I will be teaching a class on Oregon’s forest protection laws, using the third edition of the Illustrated Manual, at Tree School – Clackamas on March 24 and Tree School – Lane on June 2. I hope you enjoy this newest edition of the manual, which is often found dog-eared and grimy in the vehicles used by those whose work is hands-on forestry. In addition to OFRI’s support for this project, I want to give a shout-out to the Oregon Department of Forestry for helping fund the printing of this highly useful publication. Building code and other government officials have a chance to positively influence the national building code process to make it easier to use advanced wood products, but they’ll have to act quickly. Most readers have probably heard about cross-laminated timber (CLT) and the push to see more buildings constructed using CLT and other advanced wood products. More than two dozen such buildings have gone up or are currently planned or under construction here, making Oregon the national epicenter for these innovative structures. A big reason for the upsurge in timber construction here is that, compared to the alternatives, wood buildings are vastly superior from an environmental-impact standpoint. The wood products used to construct these buildings store carbon – lots of it. About 50 percent of the dry weight of wood is carbon, sequestered from the atmosphere as CO2, a common greenhouse gas. That carbon remains stored in wood for as long as that wood remains part of a building, and even longer if the wood can be salvaged and reused after a building is demolished. Another environmental advantage is that wood takes less energy to produce than either steel or concrete. Wood products are also the only common building material derived from a renewable resource – trees. And here in Oregon, thanks to sustainable forest practices and strong forest laws, we can rest assured the timber used for our locally made wood products was harvested responsibly. The wood products industry is a cornerstone of Oregon’s economy, particularly in rural areas, where economic development opportunities typically aren’t as diverse as they are in urban areas. Recognizing that advanced wood products carry compelling benefits both environmentally and economically, Oregon has been investing significantly in supporting development of an advanced wood products manufacturing industry here, and those efforts are paying off. Today, D.R. Johnson Wood Innovations, located in Riddle, is one of just two U.S. CLT manufacturing facilities currently producing CLT panels certified for structural use. Freres Lumber Co. in Lyons flipped the switch late last year on its new mass plywood panel (MPP) plant, producing another innovative advanced wood product. Both family-owned companies received product research and development assistance from Oregon State University, one of the nation’s top wood science and engineering programs. OSU recently collaborated with the University of Oregon’s School of Architecture to establish the TallWood Design Institute, the nation’s only research collaborative that focuses exclusively on the advancement of structural wood products. We are now approaching a critical juncture in the advancement of these efforts. Proposed amendments to the International Building Code will be voted on this year by eligible members of the International Code Council. The vote represents the culmination of a three-year process that could significantly increase the potential market for these advanced wood products. Increased market share driven by building code changes is likely to spur increased industry investment in manufacturing facilities – and that’s the payoff the state has been hoping for in its efforts. Most jurisdictions in the U.S. use the International Building Code (IBC) as the basis for their own local building codes. The International Code Council (ICC) is the body that establishes the IBC. 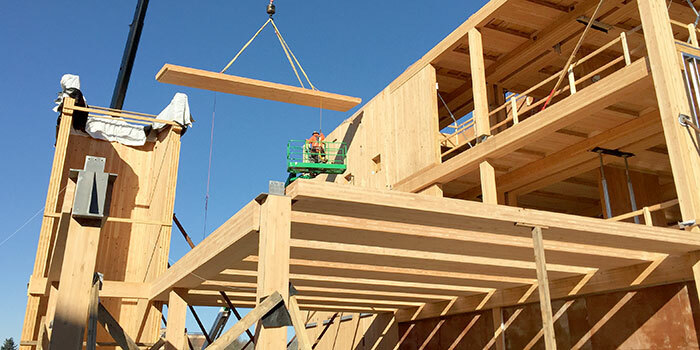 In 2016 the ICC appointed an Ad Hoc Committee on Tall Wood Buildings to develop code amendment proposals that would expand the ways advanced wood products can be used in commercial construction. The 17-member Ad Hoc Committee is composed of building officials, fire officials, engineers, architects and building-material interests. They have proposed 19 code changes for the 2021 edition of the code that would collectively allow for the use of wood structures in a much broader array of building types, including construction of tall wood buildings up to 18 stories or 270 feet in height. Most of the large wood buildings we’ve seen going up around Oregon have been permitted through an arduous and expensive “alternative methods” process, which many developers are unwilling to attempt. These code changes would clear a path to avoid that alternative process. The Ad Hoc Committee’s proposals were submitted to the ICC in January, and will be made available for public viewing online on Feb. 28. This will kick off a months-long process that culminates in a national vote in November 2018 to approve or disapprove the proposals. Voter turnouts in recent ICC elections have been very low, giving Oregon the chance to make a huge impact. In the 2016 election, for instance, only 1,247 voters participated. In Oregon there are about 125 building code jurisdictions, each of which is entitled to a minimum of four voters. Several of those jurisdictions are allotted eight voters, and a few have 12 voters. Every state agency that meets the definition of a qualified government agency is allowed 12 voters. If all the eligible agencies were to participate at close to maximum potential, Oregon could easily produce a thousand or more votes. Those votes could make a big difference for Oregon, and it is clearly in the state’s best interest for Oregonians to participate as broadly as possible. While most of the tall wood buildings are likely to go up in the urban areas, the positive impacts of an expanded advanced wood products market would be felt throughout the state and the surrounding region, with rural areas potentially having the most to gain. And because about 75 percent of the wood products produced in Oregon are sold elsewhere, other states’ building codes matter a lot. Voting in the ICC election is fairly simple. You must join the ICC, which is very easy to do online, and your application must be received by March 16. Membership is $135 - $370, depending on the population you serve, and it covers your entire agency, not just you as an individual. For example, the State Building Codes Division can join for $370, entitling it to 12 voters. Once you have joined by the March 16 deadline, the next step is to assign individuals in your organization to be your “designated voting representatives.” These individuals can be employees of the member entity or “officials of the Government Member.” So, for smaller jurisdictions that might not have enough employees to meet the maximum voter number, your mayor or city councilors can be designated. All designated voting representatives must be named in writing by Sept. 23 in order to participate in the November vote. It’s as simple as that: Join ICC by March 16, designate individual voters by Sept. 23, and vote during the November online voting period. It will benefit Oregon’s economy. If you have questions, please email me or call my direct line at 971-673-3191.